In medium saucepan, bring milk and salt right to the verge of boiling (reduce heat slightly if it starts to boil). Slowly, stir in oats, cranberries and maple syrup. After a minute, reduce heat to medium-low. Cook for an additional minute if using quick oats and 5 more minutes if using Old Fashioned oats. Stir often. When the milk is nearly all absorbed by the oats, remove from heat and cover. Let stand for 3 minutes then stir in the wheat germ. Serve with additional maple syrup and a little butter or yogurt. To toast wheat germ, spread it out over a baking pan and bake at 350 degrees for about 5 minutes. Alternatively, you could place it in a skillet over medium-high heat. Stirring often, cook until fragrant - about 4 minutes. 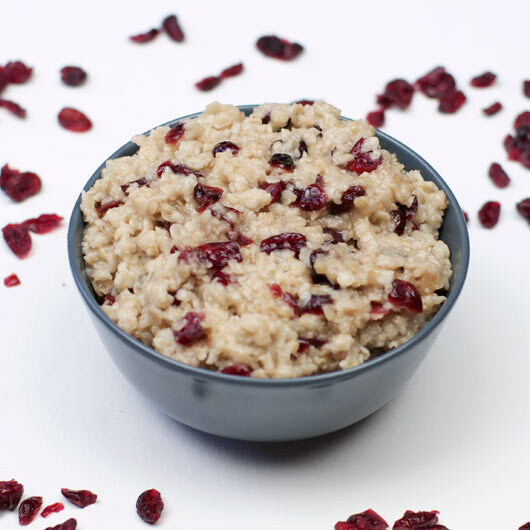 Ready in under 10 minutes, this oatmeal gets a lot of flavor from cranberries, maple syrup and toasted wheat germ. Mr Breakfast would like to thank egghead for this recipe. Recipe number 1102. Submitted 10/19/2003.